Anyone who has been in Hebrew Roots for a while is likely to have run across someone who claims Thanksgiving–like Christmas and Easter–is pagan. This article, I hope, will disprove their premise, and prove instead it was a type of Sukkot! Question: But why do they think Thanksgiving is Pagan? Answer: Because the English Harvest Home Festival was pagan. Encyclopedia Britannica states this: “Harvest Home, also called Ingathering, is a traditional English harvest festival, celebrated from antiquity. It has survived to modern times in isolated regions. Participants celebrate the last day of harvest in late September by singing, shouting, and decorating the village with boughs. The cailleac, or last sheaf of corn (grain), which represents the spirit of the field, is made into a harvest doll and drenched with water as a rain charm. This sheaf is saved until spring planting. The ancient festival also included the symbolic murder of the grain spirit, as well as rites for expelling the devil. A similar festival was traditionally held in parts of Ireland, Scotland, and northern Europe. Clearly, Harvest Home is pagan. But history recounts, from numerous primary sources like letters, diaries, and legal documents, that the Pilgrims had long before renounced Christmas and Easter for its popish and pagan origins. So they would not have been celebrating Brittan’s Pagan Harvest Home. But before I continue with the Puritans, allow me to share what should be interesting facts to those in Hebrew roots, facts about Christopher Columbus. The following are excerpts from The Light And The Glory, by Peter Marshall and David Manuel. Peter Marshall and David Manuel, in their for-mentioned book, included the following translated excerpt from an obscure volume of Columbus’s Book of Prophecies, available only in Spanish. More recently, the number of Spanish scholars–Jose Erugo, Celso Garcia de la Riega, Otero Sanchez and Nicholas Dias Perez–have determined that Columbus was himself a Jew. His survival depended upon suppression of that fact during Spain’s Inquisition. But Jewish bloodline or not, he was indeed a believer in Yeshua, as his journal entries prove. In their book, The Light and the Glory, the authors related the often inspiring, but ultimately sad end, due to Columbus’s succumbing to a lust for power and gold. His history set the tone for the rest of their book, written in the late 1980s, which documents the special call of God on America and those founding it–men and women who like the children of Israel made a covenant with God, only to have their descendants break it, time and time again. The authors raise the question: What if God deals with whole nations the way he deals with individuals? After all, Israel, the nation and the people, was chosen to be a light to all other nations. And Deuteronomy 7:6-9 tells us that had they obeyed, they would have been mightily blessed. The problem was they never stayed faithful, never kept their covenant. Now back to the Pilgrims. In the Plymouth Colony, from the 1620s to 1850s Christmas and Easter, associated as they were with paganism and idolatry, were illegal. For this reason, I am quite sure that the Pilgrims did not celebrate that first Thanksgiving as Harvest Home. Furthermore, prior to their departure for the New World, those we call the Pilgrims had left England for Holland, in search of religious freedom. They remained in Holland a decade, living among Sephardic Jews, who had been expelled from Spain in 1492. For the ten years the Pilgrims spent there, they witnessed the celebration of that set apart time called Sukkot. Like Sukkot, that first Thanksgiving in 1621 was eaten outdoors. And as the Jews, according to tradition, welcome friends to join them for a meal in the Sukkah, the Pilgrims invited the Wampanoag tribe to their first Thanksgiving table. According to history, the Wampanoag tribe feasted with them for three days. But how long did that first Thanksgiving last? Could it have gone on for seven days plus one? History doesn’t say. But that first Thanksgiving they recited Psalms 106 and 107, “Give thanks to the Lord for He is good, for His kindness endures forever,” as they do in Jewish liturgy for Sukkot. 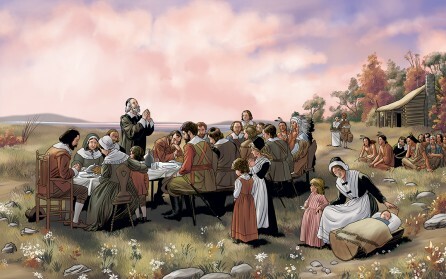 William Bradford, the governor of Plymouth Colony studied the Hebrew Scriptures, and history recounts that the Pilgrims saw themselves as a new chosen people being led to a new Promised Land based on the parable of the vineyard. Matthew 21:38-41. But seeing the son, the vinedressers said among themselves, This is the heir. Come, let us kill him and possess his inheritance. And taking him, they threw him out of the vineyard and killed him. Therefore, when the lord of the vineyard comes, what will he do to those vinedressers? They said to Him, Bad men! He will miserably destroy them, and he will rent out the vineyard to other vinedressers who will give to him the fruits in their seasons. “Though I am grown aged, yet I have a longing desire to see, with my own eyes, something of that most ancient language, and holy tongue, in which the law and Oracles of God were written; and in which God and angels spoke to the Holy Patriarchs of old time; and what names were given to things at the Creation. So now that you have glimpsed the hearts and souls of those who celebrated that first American Thanksgiving, go ahead and buy that turkey. Invite your family and friends. It is never the wrong time to give thanks to Yahweh. And while you are still at the table, take a page out of that first Thanksgiving; have someone read Psalms 106 and 107. Am I wrong, or did God make the covenant with the children of Israel? It was their responsibility to agree and obey. However, they did not make the covenant. I’m not sure that coming to America, even for the most righteous reasons rises to the level of covenant. I’m not convinced that man can make a covenant with God. He has all the power, it seems he would make the covenant. That being said, I don’t have any trouble imagining the Pilgrims celebrating sukkot. 2Ch 29:10 Now it is in my heart to cut a covenant with Jehovah, the God of Israel, and the glow of His anger shall turn back from us. 2Ch 34:31 And the king stood in his place and made the covenant before Jehovah, to walk after Jehovah, and to keep His commandments and His testimonies and His statutes with all his heart, and with all his soul, to do the Words of the covenant that were written in this book. Ezr 10:3 And now let us cut a covenant with our God to cause to go out all the women, and those born of them, according to the counsel of the Lord and of those who tremble at the command of our God. And let it be done according to the Law. Jer 50:5 They shall ask the way to Zion with their faces pointing there, saying, Come and let us join ourselves to Jehovah in an everlasting covenant never to be forgotten. Thank you for the sanity of your article. It is too easy among Hebraics to see the devil in every celebration due to the fact that some do have pagan origins and are to be avoided. Thanks-giving is a habit which we ALL need to be more vigilant in acting on, including those of the Hebraic persuasion! Strangely, I have not noticed that they differ from other believers in church contexts, when it comes to being thankful! Why? This is particularly troublesome when you consider that the prayers of our Hebrew brothers and sisters in Judaism are so full of thankfulness – repeated many times per week! The place where this will be significantly observed is whether or not the next generation of Hebraics demonstrates more thankful lifestyles or carry over the egocentric attitudes of the current culture by which we are all, more or less shaped. Keep your decisive and penetrating perspective, not to alarm, but to seek the truth and promulgate this to hearing ears! Thank you so much, Dr. David Sloss, for your kind words. Shalom! Thanks chris for the article. Very informative and definitely answered a question I undecive about.